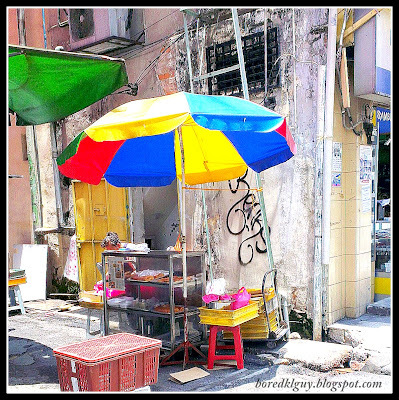 If you happen to pass by Lorong Yap Ah Loy, you will see an elderly lady with a simple pushcart stall set up at the corner. 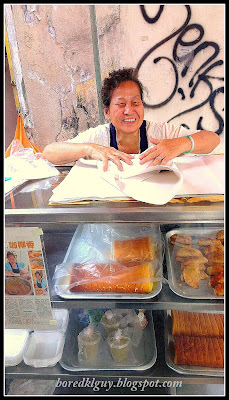 She sells one of the most delicious kaya swiss roll in town. In KL town, there are lots of good food to be found at every nook and cranny if you know your way around. 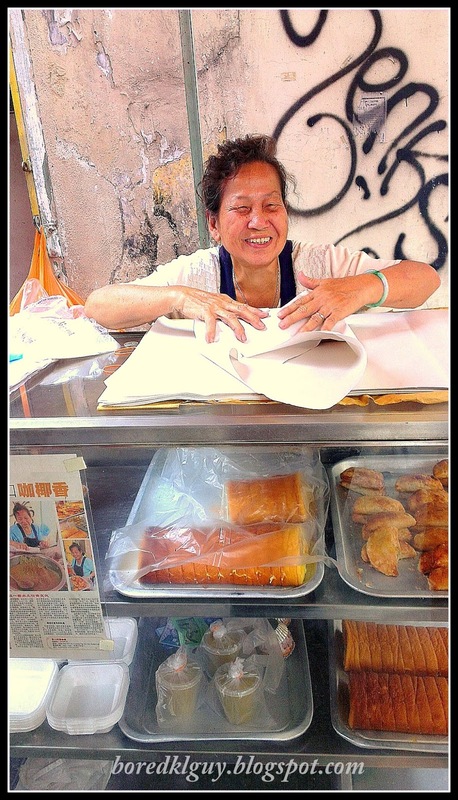 Apart from her famous kaya swiss roll, she is also selling egg tarts, kaya puff and individually packed kaya in a container. 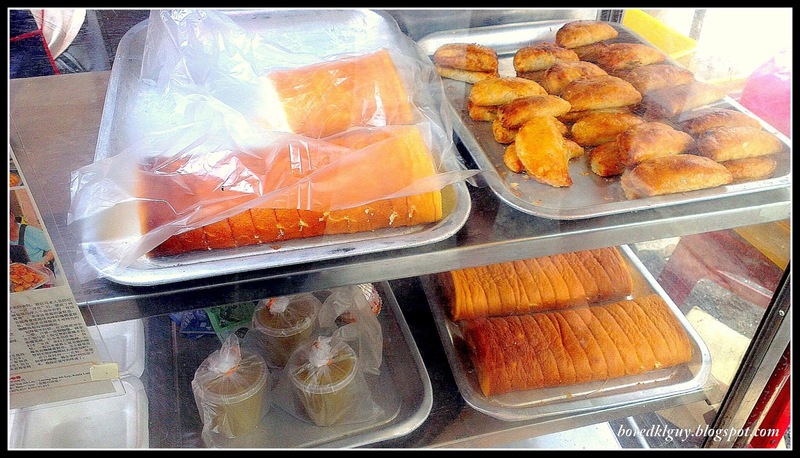 Here's the aunty selling her kaya delicacies. Look how sweet and joyful she is. She is a very friendly lady and always ready with a smile. I joked with her about her appearing being featured in a chinese daily and she was laughing that it was a compliment from one of her customers. She proudly move aside the wrappers for me to capture photos of her delicacies. 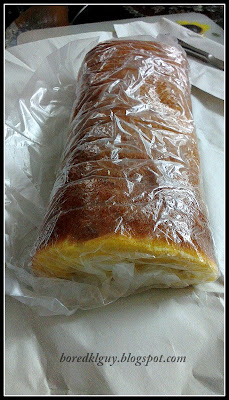 During this visit, I bought a whole loaf of her kaya swiss roll (RM14) to be enjoyed with my family during dinner. Her stall is opened daily from 8am to 3pm (closed on Sunday and holidays) and usually by after 1pm, there won't be much left since most people like me buy her swiss rolls in bulk. Here's the kaya swiss roll neatly wrapped in plastic wrap and later protected by another layer of mahjong paper. The loaf of the swiss roll is quite huge and it's already pre-cut into 12 slices for the convenience of her customers. 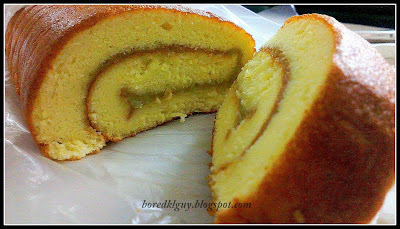 The swiss roll is soft and rich in texture. Every bite you will get the aromatic taste of her homemade kaya. Her swiss roll is quite filling since it is very dense and it is great to go with your cup of coffee or tea. 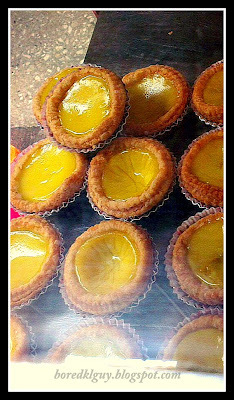 I will return to try her egg tart and kaya puff another time.